When you cannot speak your emotions openly to your dear ones, then you can send them a bunch of beautiful flowers from Winni and can convey all your heartfelt emotions to your near and dear ones residing in a. Flowers are considered the best gift that you can send to someone on their special day. Flowers also helps to decrease the stress and bring positivity into the surrounding. So if you have an occasion coming up and if you want to delight your dear ones then you can place your order online from Winni. We have a broad variety of flowers that can fit Perfectly on all occasions. Winni offers high quality of flowers that are hand-picked and designed to perfection. You can buy and send fresh flowers online in Ambernath from Winni. It is also very easy to place the order on our website as all it takes just a few clicks, and your order is placed. Our flower delivery in Ambernath offers you a wide range of flower arrangements crafted beautifully by our best florists. From enticing roses to colorful lilies and from gorgeous gerberas to vivid orchids, our online service in Ambernath provides you the most beautiful flowers for your close ones. Whether you want to wish your beloved one a very happy birthday or congratulate someone for achieving a milestone in their life or just say sorry for your mistake, a beautiful flower bouquet will always do the trick. If you want to send the Valentine flowers at the doorstep of your lover then you can choose Winni. Now you don’t have to waste time in visiting different flower shops and carry flowers to the doorstep of your lover, as you can place your order for your favorite flowers from Winni and leave rest on us. Send your warm wishes to your near and dear ones online from Winni by sending them the flowers of their choice. We have roses, carnations, lilies, gerberas and many more flowers in our floral category; you can now choose the choice of the delivery slot as per your choice also. Winni offers midnight delivery, same day delivery, fixed time delivery and standard delivery options that you can select in Ambernath. 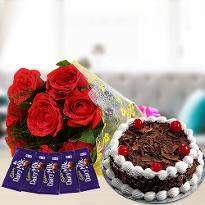 Suppose if you want to send flowers at midnight at surprise your dear ones then you can do it with midnight delivery. With our impeccable flower delivery, you can be sure that your flowers will reach their destination safely on time. You can make your occasion more fun filled by adding cakes and soft toys along with your flowers. You can also add your personal message along with your flowers and put a big smile on the face of your dear one. Products in this category have been rated 4.9 out of 5 based on 164 reviews.